Which Model Has the Most Vogue Magazine Covers? These Faces Are the Most Familiar to Longtime Vogue Readers. Vogue first began as a weekly newspaper in 1892 and appearing on the publication's cover quickly grew to become a coveted career goal for many fashion models. When Conde Nast acquired the magazine in 1905, it turned it into something along the lines of a biweekly publication, and the number of cover opportunities increased twofold. American supermodel Lauren Hutton first appeared on the cover of Vogue in the 1960s, and she's amassed a whopping 26 covers since then. Hutton was one of the most sought-after and highest-paid supermodels in the world at the peak of her career. Three different Vogue editors chose her to grace their covers. She was well known for the small gap between her front teeth that set her apart from other models. Hutton was also an actress starring in films, and T.V. Hutton went on to have a successful modeling and cosmetics career as well, defying stereotypes about youth and beauty when she appeared in a Calvin Klein underwear ad in 2017—at age 73. Tied for second with the most Vogue magazine covers is supermodel Karen Graham. She was born in 1945 in Mississippi and began modeling in 1969 after a fateful encounter with modeling agency owner Eileen Ford. Graham decided to take the stairs instead of waiting for an elevator one day in Manhattan. As she passed Eileen Ford in the stairway, Ford began chatting with Graham and encouraged her to become a model. 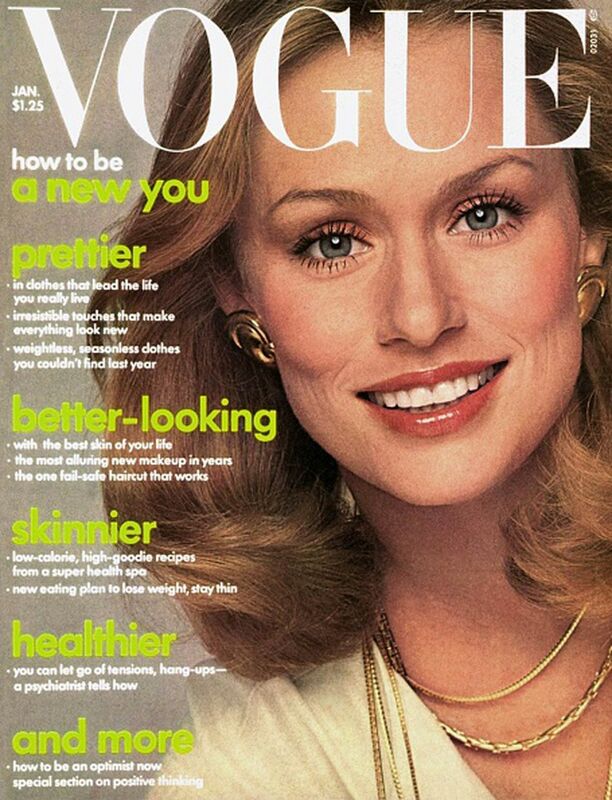 Her first Vogue cover was in 1970, and by 1975 she had covered the magazine 20 times. Not only was Graham a successful model until her retirement from the industry in 1985, but she owned and operated a successful fly-fishing business as well. She also had a lucrative contract with ​Estee Lauder from 1970 to 1985. Born in England in 1942, Jean Shrimpton began modeling in 1960. She was included as one of Time magazine’s Top 100 influential fashion icons of all time and has covered Vogue 20 times. Shrimpton was one of the first supermodels and also one of the most highly paid models of the 1960s. Raised on a farm in Buckinghamshire, she was discovered in London's Hyde Park at age 18. Shrimpton was credited as being partly responsible for the launch of the miniskirt when she wore a dress that ended above her knee at an appearance in Melbourne in 1965. Forbes magazine reported in 1995 that Cindy Crawford was the world’s highest-paid model at that time. She began modeling in her sophomore year of high school, and her status as a modeling icon and international celebrity steadily rose in the 1990s. Her career has included contracts with ​​Pepsi, Maybelline, Revlon, and Clairol, as well as 18 Vogue covers. Actor Richard Gere is one of the few men ever featured on the cover of Vogue. He appeared alongside Crawford, his then-wife, on the cover in 1992. German supermodel, Claudia Schiffer’s career, has been nothing but impressive since she began modeling in the early 1990s. She's tallied up 16 Vogue covers. Schiffer was handpicked by Karl Lagerfeld to be the face of Chanel and starred in a campaign for Guess jeans. She has had numerous contracts with other luxury fashion brands. At 5 feet 11 inches tall, Schiffer was a catwalk regular for most of her career. She also became actively involved in charity work with UNICEF. Like Claudia Schiffer, Phoenix native Amber Valletta has graced the cover of Vogue 16 times. Valletta's first cover appearance came when she was just 18 years old. She had some success with an acting career and later spoke out about her struggles with addiction. Jean Patchett graced two Vogue covers in 1950, shot by two different photographers. Her first cover was in September 1949 when she was 22 years old. Her style was different from other models of that era. She came off as a bit aloof rather than all smiles and friendly charm, and some of her habits supported that trend. After she married in 1951, Patchett would work only from 10 a.m. until 4:30 p.m. so she would be available at home to prepare her husband's meals before and after those hours. She died in 2002. Veruschka—full name Veruschka von Lehndorff—appeared on 16 Vogue covers in the 1960s. A German, she was discovered in Florence at the age of 22 and became a full-time model. Then she met Eileen Ford in Paris in 1961 and promptly packed her bags and moved to New York City. Veruschka quit modeling abruptly in 1975 after a disagreement with Vogue's editor-in-chief at the time, Grace Mirabella. Then, in 2010, she turned up on the catwalk for designer Giles Deacon at London Fashion Week. She was 71 years old at the time. She's best known to sports fans as the wife of Super Bowl–winning quarterback Tom Brady of the New England Patriots, but Brazilian model Gisele Bundchen has had quite a career of her own. One of the original Victoria's Secret Angels, Bundchen ushered in a new style of healthy-looking, curvaceous models. She's been listed among the world's most powerful women by Forbes magazine and serves as a goodwill ambassador for the United Nations Environment Programme. Gisele also has a non-profit organization called Rainforest Alliance and was one of the highest-paid models in the world at the height of her career. Kate Moss was discovered in JFK Airport in New York when she was just 14 years old. She took the 1990s by storm when she collaborated with Calvin Klein and is credited with launching the birth of the grunge, heroin chic era of modeling. Her party-hearty lifestyle caught up with her in 2005, but she returned to modeling after a short break and was second on Forbes top-earning models list in 2012. Moss has since launched into the business world with her own clothing line, and she is currently a contributing fashion editor for the British edition of Vogue. Veruschka's appearance was reportedly the most expensive Vogue cover shoot ever. It cost about $1 million, and this was back in 1960s' dollars. The shoot took place over a period of about five weeks in Japan. Ninety dogs have made their ways onto Vogue's cover as well, including Gisele Bundchen's Yorkie in 2001.